We did it for the second time! A lot of support was received from KOICA, Bioversity International and RDA. This time the CGKB knowledge base was mostly completed with most web pages with many sorts of information and links. It was therefore easier to navigate through while talking about subjects covered by the CGKB. This shows one of the great benefits of this site, that anywhere and at any time (as long as connection to internet is good and reliable!) information can be accessed and links explored. We have distributed some CD’s with information and files but soon these are outdated as new information is regularly uploaded into the CGKB. It was a great experience, with a wide range of expertise amongst the participants from 8 countries. Time was just enough to browse some important genebank issues but knowledge was shared and opportunities and possibilities shown, that can be explored later in their own countries and specific conditions. We have placed some pictures of the training in our flickr album. Please fill free to add your pictures too so that all the participants can share them! 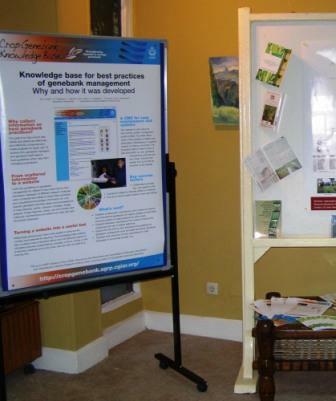 What is new and noteworthy in the Crop Genebank Knowledge Base? A lot is happening in the last few weeks and we want to share these news to keep you in the loop of the ongoing work. The site is growing all the time! The site is getting its pages fully uploaded. The 9th crop, cassava is going to be uploaded soon! And the great news about the site expanding plans is that we have just started translating the crop pages into Spanish! This is the first (and hopefully not the last!) extra language we are introducing. They will become public very soon. The first one will be maize! Please let us know if you would like to participate translating it into your native language in your country! This site belongs to all of us that work within and across genebanks, so help us to improve it and making it better! Send us your comments and suggestions! The Knowledge Sharing Fair for Latin America and Caribbean (www.sharefair.net) is happening this week in Cali, Colombia, hosted by CIAT. An event with 200 participants from 18 countries and 70 organizations, in the fields of agricultural research, development and food security, mostly including Spanish speakers from the Latin America and the Caribbean. Agricultural research institutes, rural developing organizations, Universities and communicators were the main representatives. Parallel sessions about knowledge sharing tools and methods are the highlights of this fair. Informal discussions and booths with various dissemination materials provide a diversity of tools for every taste. Several CDs of the website were distributed as well as leaflets and bookmarks with the URL of the site. The technologies are easy to dealt with; getting contributors to contribute is often a challenge. It is important to document how the websites and databases were developed and structured so that continuity is assures. Sustainability and updates after projects finish should be planned and is a common problem. This was the perfect venue to disseminate a website that will be translated soon into Spanish (watch our blog in the next few days to know more about this and other improvements happening soon)! It was also a great opportunity to visit the CIAT genebank and strenghtening collaboration to improve this website! End of the month, time for updates. Last week we had the pleasure to look through the various pages of this site and see the end of the tunnel! All planned pages are completed with the initial information we envisaged. Some will still have new links uploaded soon, when relevant information is available and published elsewhere. All the other pages are now finalized (but they should be updated regularly). We have worked hard with so many collaborators and contributors, but we are finally getting there. It was a monumental task, that kept many of us working often until late, week and weekends, but well worth! It is very rewarding seeing things taking shape. However we should not forget that we also have to continue working hard to maintain the quality of what we developed as well as expanding it when opportunity arises. A great thank you to all that made this site possible and contributed to enrich its content, navigation and layout. This week we had the final review of the project that made this site possible. We had a great opportunity to show the content and potential benefits of this sharing platform that was dully appreciated. This week we also had a collective paper entitled “Sharing knowledge on best practices to manage crop genebanks” oraly presented in the IAALD XIIIth World Congress on Scientific and Technical Information and Rural Development, from 26-29 April 2010 in Montpellier, France. The paper highlighted our experience of working together, the challenges we faced and the lessons learned and ways to move forward to keep the momentum. This was a great opportunity of producing excellent and practical visual training materials with existing local resources. This knowledge base is already expanding before being formally finished. This is a great example of usefulness and relevance. We have now a good sense of responsibility and ownership of a good product that should keep us together, continuing working towards a common goal. This message is posted a bit late… It was supposed to have been posted in December. Today is the last day of January and that prompt me to rush and post it before it is too late! This is the result of the end of the year workload that I am sure many of you have experienced. We would like to thank all of you that contributed to the website with text, comments, revisions, visual aids (photos, videos) and general support to our work. Many of you have worked often day and night, week days and weekends to finalize urgent taks and we are grateful for such dedication and commitment. We are finishing the first phase of our work, the upload of all the major components of the website. Some work will be finished in January 2010 and the rest by the end of March 2010. Some of the initial coordinators and collaborators have been promoted, shifted positions and moved to new jobs, passing most of the work to colleagues and new collaborators. This shows that this knowledge base was built in a flexible way that can grow and expand. The end of the year meeting with all the GPG2 (the WB project that financed this work) activity leaders (most active contributors of this website) showed that the website is a valuable tool to disseminate and share knowledge and many activities not initially planned to be included are now wishing to display their results within our pages. We are now adding some new menus into the Management Strategies. The seed crop pages are in the final stages, doing the final tuning and last revisions. Regarding the clonal crops, we are also finalizing the cassava pages, that will be published soon. The banana pages are also partially finalized and will be the last crop to be finished. We are also re-structuring and completing the Procedures page as well as finalizing the Learning Resources, to make them more interactive and attractive. Hoping to have a great 2010 with even greater contributions and feedback from all of you! In the last few weeks we have been busy promoting this knowledge base. We want to let potential users as well as potential contributers to know more about it. The side event session was entitled “Global Public Goods and the Future of the CGIAR Genetic Resources System”, organized by the CGIAR System-wide Genetic Resources Programme (SGRP) . The CGKB was presented amongst other SGRP products. Several people attended the event and congratulate the team for the great job being done. A few participants also manifested interest to make contributions to the site pages. On 09 November 09 at the poster session of the 32th meeting of the ILRI board, ILRI, Addis Ababa, Ethiopia. The poster and the leaflets are great ways to show our product and make people aware of the potential of the information being gathered and the knowledge being shared. • Justify the need to use the various characterization methods described (biochemical, cytological, etc). • Include outstanding work on diversity studies both at morphology and molecular levels. • Need for more guidance on how to develop descriptors for new crops. • More background information about when to choose to implement a field bank, DNA or Cryo bank, in addition to a seed bank. • Include more practical issues about regeneration (to help decision making). • Web link to the genebanks all over the world or information about them. • Count the number of visitors. • Include information about activities and training programs on genebanks. • Version in Thai language, version in Korean. • How the characterization data can be interpreted. • More information on the content. • Update new information and more details of modern methods whenever possible. • Include links to standard requirements, standard forms, descriptors and other documents. • More protocols about molecular work and tissue culture. • In several pages there is no direction to go on top (previous menu/main sub menu). • Pictures should be active for example the learning space, crops. • Need of improvement on the pages that are still under construction. • Management should have elements more directly related to genebanks. • Many references do not have PDF links. • More information about utilization and exploration. • More green and brighter colors (related to agriculture and crops). These are all important comments and suggestions that were already discussed within the group working on this website. Action is being taken in most of the points, whenever possible. The phrase in the banner was already improved and many pictures are now active links. The colors seem to be a very personal and very variable from person to person. The chosen colors (blue and orange) are related to the SGRP, the owner of the site. The logo on the top banner is also related to the same, so we have decided to leave it as it is. We do not have at the moment, the capacity to increase the number of crops, expand information on utilization and exploration, or translate it into other languages. These could be possible topics for a future phase of the project. We have however created a template form to receive information on new crops. • If you would like to suggest a new crop and submit the best practices information please click here. • If you are interested to translate some pages of the website into your language, please contact us. A lot of questions concern characterization and regeneration procedures. We will try to incorporate relevant questions into FAQs, but major details will have to be done in future updates of the website. Do not forget this should be a continuous process with regular updates! Your feedback is very important to prioritize future updates and additions. Regarding the need for more detailed protocols for molecular work or tissue culture, we will try to have some more practical links on these pages or a better defined list of contact persons (a few contact names from leading institutes in these areas). We are aiming to finish revising the content and links until December 2009, as the site is still under construction. We are still working on the procedures page (although we are prioritizing the information by crops) to have some more detail and better references. Many of the crop references are also being checked and linked to URL or PDFs. Most pages should be finalized by the end of 2009. Although a lot of feedback was gained from the questionnaires, a lot of useful and important information and feelings was equally obtained through informal interactions with the participants. In future initiatives it is important to plan a good balance of formal and informal feedback. During the practical sessions of the workshop, many genebank procedures were studied and there were great photo opportunities to be used for the site. Thank you Young-Wang Na for letting me taking photos of the laboratory practices! I had some problems with my camera but luckily I managed to have many photos taken with the help and support from Chan-Ki Shim (RDA) and Andreas Ebert (AVRDC). Thank you so much for your help! I would also like to thank Myung Chul Lee and Yu Mi Choi for the great tour of the RDA genebank. It was extremely interesting and I also managed to take very useful photos to illustrate relevant pages in our website.